Hudson Valley Resort and Spa WTP Filtration – KC Engineering and Land Surveying, P.C. KC designed a water filtration system for the Hudson Valley Resort and Spa in Kerhonkson, NY. The resort had Ground Water under the Direct Influence (GWUDI) of surface water. KC performed the necessary engineering services in connection with this water system modification project including the engineer’s report, plans, and specifications. KC also assisted the owner in obtaining bids, reviewing submittals, and supervising construction. The existing water treatment plant was supplied by two artesian wells. The wells were located at very low elevations at the bank of the Stony Kill Creek. The wells, although artesian, were prone to infiltration of surface water due to their location. 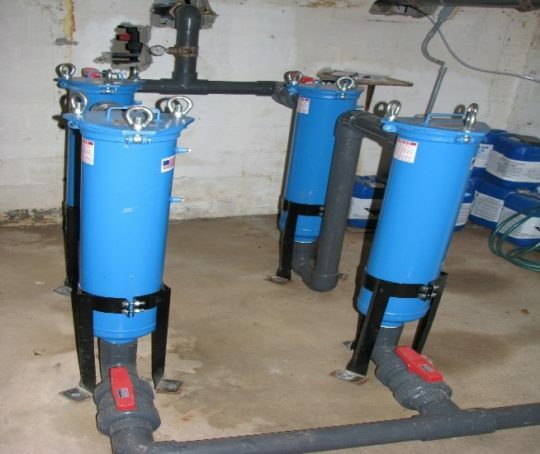 The existing water treatment facility at the resort was modified by adding bag filtration. Two independent trains of filter units were installed. The trains run parallel for redundancy in the event that one fails. Each train contains two filter housing units running in series. The first filter housing unit holds a 5-micron filter bag and the second filter housing unit holds a 1-micron filter bag. Proposed pressure gauges before and after the trains allow the operator to take readings to determine when the filter bags need to be replaced. A turbidity meter was installed to take post-filtered water samples every four hours. The water is chlorinated post-filtration, using the same crock that is used for pre-filtration chlorination. The proposed bag filtration system was approved by the Ulster County Department of Health and provides the necessary treatment for GWUDI, while minimizing construction and operation costs.